These are some of my latest works. 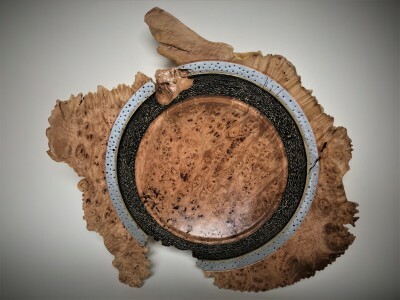 The two platters are broadleaf Maple burl slabs with a textural embellishment and the use of metal painted dry brush technique. They are 12 to 16 inches at their largest points. Each is finished with a satin polyurethane. 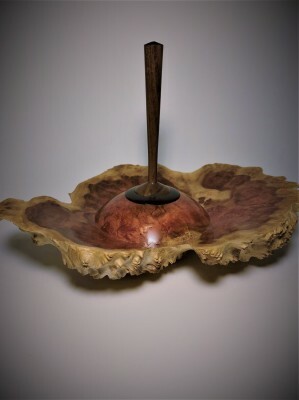 The two hollow forms are created from maple burl caps. 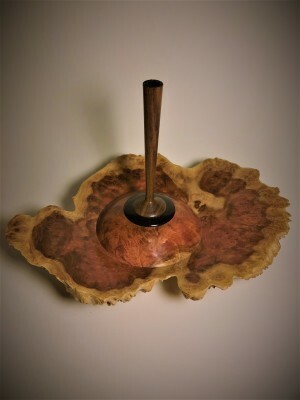 The burl surface is preserved on the bottom of each piece and the hollow vessel that is made is sealed with a threaded insert and finial. These images represent several of my new works using polymer resin clay. 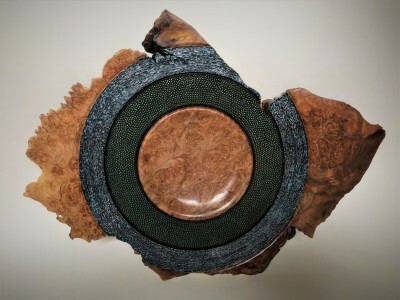 The boxes are made from kiln dried hard maple which works well with the process of baking the clay to form a ceramic-like coating on the wood. They are threaded and will securely hold a variety of precious items. Perfect for an engagement ring or jewelry but are an exceptional gift on their own. Several workshops and demonstrations are scheduled this year to help you learn the secrets of the box. A special note: When I began doing these clay creations I was happy to find a great supplier of clay canes whose designs are interesting and that I found attractive. Please check out RAW POLYMER RESIN CLAY CANES on Etsy at IKANDICLAY. There are many others that have wonderful designs as well. I have used these created canes on several of the early boxes but have learned over the past few months how to create my own raw canes. You may find that ordering these rather than creating your own is a better option. It is still a fun process no matter the route you take. I hope you enjoy this latest exploration into making something a bit different in woodturning! Remember the possibilities are endless!